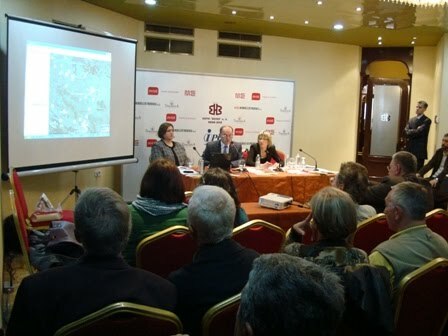 At the presentation of the "Bosnian Atlas of War Crimes" held in Banja Luka on 31 March 2010, the director of the Research and Documentation Center in Sarajevo - Mirsad Tokaca - discussed the number of victims that were killed during the 1995 Srebrenica Genocide. Serbian media misused Tokaca's statement by reporting that 500 people on the list of Srebrenica victims are still alive. "We emphasize that the statement about 'the 500 missing persons who were found alive' is taken out of context and presented to the public in a way that creates the impression that the list of those killed or missing in Srebrenica includes people who are still alive. This allegation was first published by SRNA [ultranationalist Serbian news agency], and then the same information appeared in other media located mainly in the Republic of Srpska [Serb entity in Bosnia]... We hope that the public will realize that this was a classic media abuse [manipulation]." "If you would look at Table 1 on page 7 in the 2000 report, you will see that there were 5 -- on the ICRC list and PHR list were 5.712. On the ICRC list only 1.586. That makes 7.298, which is 101 less than the ICRC number that you quoted, 7.399. In addition, we had access to information that the ICRC did not have at that time, I believe, which is the voters' list, 1997 and 1998, which were used to check that missing people were -- that there were no survivors who registered to vote. And we also checked difficult cases where the data were incomplete with the 1991 census.... The only thing is the information from ICRC, that 6 persons were found to be alive. So we subtracted that number." "People who are missing and believed to be dead should not be able to vote. So when we had this complete list of people who were registered to vote in 1997 and 1998, we wanted to make a comparison to see if there were, in fact, people believed to be missing who were registered to vote. So we did a very careful comparison, and we found nine names that we believe are unique and that are appearing on both lists of missing persons and the list of voters. So there is an error somewhere. Either these are not really missing persons, they are survivors, or somebody misused their identities because they knew they were dead, so they misused their identities, perhaps to get extra -- additional political influence, to vote twice. Or third, there is a mix-up due to data problems and so on. But the conclusion is that the number was very small. Nine, that is less than -- that is about one-tenth of a per cent. To be on the safe side, we subtracted these names, although it is not certain that these are survivors.... We asked the ICRC whether they knew about people who had survived, who they later learned to be survivors and not dead on the list of missing persons since January 1997. And they told us there were six persons out of 7.000, but they would not reveal their identities to us. So to be on the safe side, we subtracted another six persons from the total number. We could not delete those from the list that was also submitted to the court, because we didn't know their identities. In this way we ended up with 7,475. Asked "how reliable do you think this number of 7.475 missing persons is it? ", Helge Brunborg responded: "We think that the number is very reliable as a minimum estimate... the number could easily be higher because there were records that we excluded to be on the safe side." "Of the 13,000 persons DNA identified in the context of BiH, 6,414 were DNA identifications of persons missing from the 1995 fall of Srebrenica. To make these DNA-based identifications, ICMP has collected almost 87,931 blood samples from relatives of the victims, which represent almost 28,964 missing individuals. ICMP has also received 43,729 bone samples from mortal remains of persons recovered from mass graves in the region." "The overall high matching rate between DNA extracted from these bone and blood samples leads ICMP to support an estimate of close to 8,100 individuals missing from the fall of Srebrenica."